Possibly the only switch accessible water blaster available anywhere! Last few of this type in stock (green or clear). Get ready for the ultimate action packed water fight. Feel the power of this super charged motorised water blaster as you fire the high velocity electric hydro pump, using a single accessibility switch. 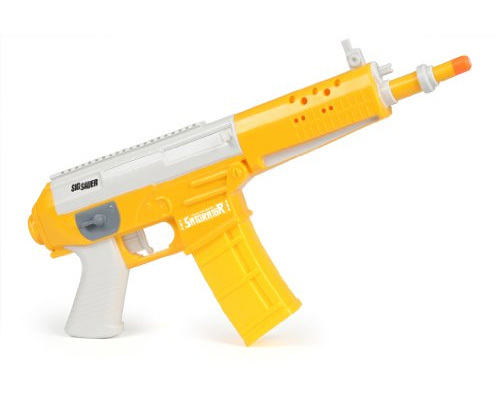 Although not as powerful as a super-soaker type of water pistol, these guns do not require any manual pumping, fire 4 bullets of water every second up to 6 metres away and are guaranteed to get your target very wet, very quickly! You can also: Water your plants; Play target practice outdoors or in your bath; Use watered down coloured inks to create splatter art; Cool your dog down on a hot day; Clean a dirty relative; Spray your neighbour then hide; Wash a car (very slowly); Fill the bird bath; Rinse off the dishes; Fill water balloons; Squirt yourself; Fill an animal's water dish; Spray clothes for ironing; Cool off a friend after exercising; Give players a drink at athletic events; Write water messages on the pavement; Shoot at paper targets; Wet down someone's hair when getting a haircut; Have fun! Easy to prop up on a level surface such as a wheelchair tray. Activate using the trigger or an accessibility switch. Great fun Cause and Effect device. Fires water up to 6 Metres away. Green or clear. Design may vary. E-mail to find out what I've got in. 4x AA batteries required. Not included. See this How To Use your Saturator Video for more.